James Grant, a 2015 BSc Computer Science with Games Technology graduate, has created Weavee, an algorithm which enables candidates to discover their careers while searching for employment. City alumnus James Grant is helping job seekers to find their careers through Weavee, the algorithm he has created. The 2015 BSc Computer Science with Games Technology graduate felt that beyond matching candidates with jobs, job seekers needed a platform to help them find a career suiting them, based on their skills and abilities. During his time at City, James completed the Professional Pathway scheme run by the Professional Liaison Unit (PLU) within the School of Mathematics, Computer Science & Engineering. 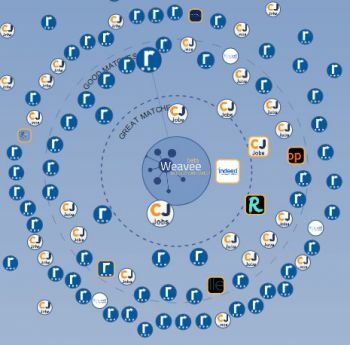 Weavee was first envisioned as a social networking website. After a period of technical development it was launched as a minimum viable product (MVP). However, while he was working as a freelancer at Hays Recruitment, he discovered that Weavee would be more valuable as a recruitment tool. Based on this, he started working on an IT job-matching algorithm with a distinctive interface which is now awaiting a patent. Weavee is currently based on a matching algorithm which James would like to grow into an entire testing suite which helps a person find their skills and discover their abilities. James thinks this would improve the matching algorithm credibility with the intention of offering pre-tested candidates to agencies who want to place candidates, with each profile providing an accurate description of each candidate. "James is yet another example of a Professional Pathway (PP) graduate who has used the PP experience to fast-track an IT career - moving into a senior IT role or launching a tech business of their own." Please visit this weblink for more information on Weavee. A social networking site refers to any website that enables users to create public profiles within that website and form relationships with other users who access their profile. Social networking sites can be used to describe community-based websites, online discussions forums, chatrooms and other social spaces online.